Click the links to read entries for various days! Day 4 - Happy 1st Blog-iversary to Me! Day 12 - Why Am I Running? Day 23 - Just Say "No!" Day 24 - Old Cat, New Trick? Day 29 - Did You See the Moon? Day 31 - Get Out of Your Pit! who are writing every day. I hope you will check out her blog if you aren't already familiar with her. Everyone has chosen a topic. Understand this - I don't claim to be an expert, but I have a craving. During the next 31 days at A House and Yard I will begin my quest for order and (hopefully) you will read along and (ideally) be inspired to take action with me. See you Monday! p.s. I'm kind of nervous about this project and am forcing myself to post my intention so I don't chicken out. I even made my own little button up there. Isn't it cute? I love that you are doing this! I am at a similar stage currently, but has mostly to do with that dadgum extra room that we love to shove everytihng into and call our "office". There's some pretty important things in that room, mixed up with trash, chinchillas, magazines, and overall, not as important things. So I'm taking baby steps and will be organizing and restoring order to that room... that will eventually become a nursery! Maybe your blog can inspire me along the way haha! In this house we don't have a schoolroom which was the place I could stash junk - ahem - treasures for later use. I have stuff in the shed loft, the cellar, and simply everywhere! Ack! Oh I want to do it as well! Hope I can make a button- I have a picture but do not know how to do it! Hi again! To make my button I resized a picture in the shape of a square, then added text online at PicMonkey - www.picmonkey.com. After editing you can save a copy of the new button to your computer. Have fun! Thanks for visiting. 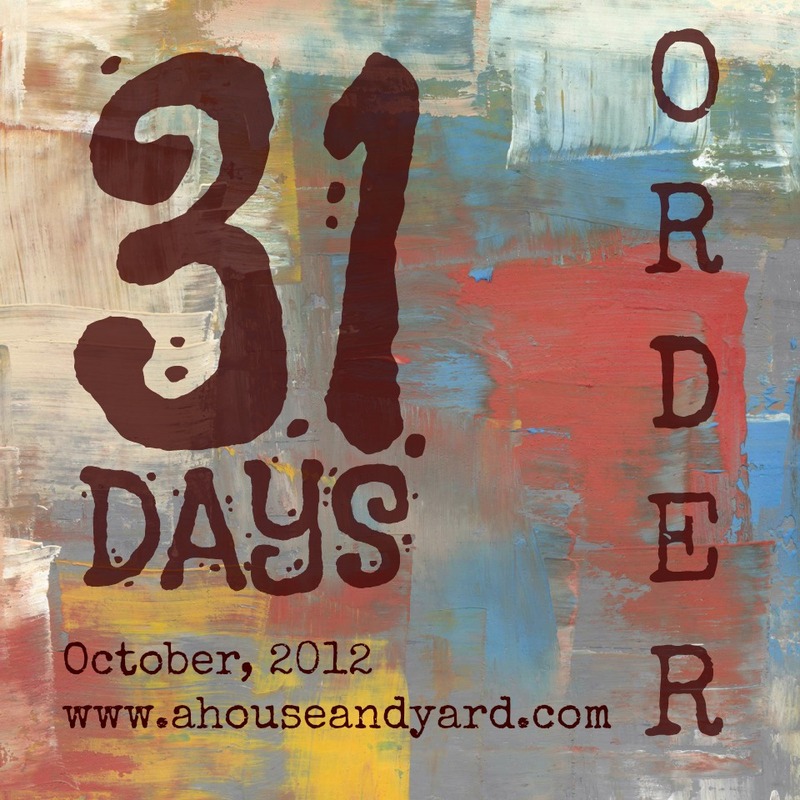 Are you doing 31 Days, too? I love that you didn't say organized or any other word. 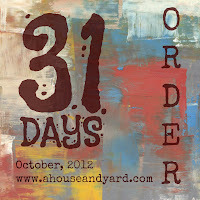 "Order" just speaks deep to me - not just of orderly surroundings, but the internal order that accompanies it. I'll definitely add you to my follow along list of 31 Dayers! Looking forward to it! Thank you. You saw my heart for this 31 days. that sounds exciting! You can do it ! I promise i will not nag you in any way, i will help any way i am able. I love you and this makes me excited. Your hubby.